Emily Explains: What if I have to unravel my knitting again… Is this okay? I learned how to knit during my first year at college. I took a machine knitting class where I made my very first knitted garment (a pink dress covered in pink florals)! At the end of the class, I immediately begged my friends to teach me everything they knew about handknitting. I was completely hooked. I began collecting yarns that grabbed my attention wherever I went. I was very drawn to bulky, single ply soft wooly yarns. They were the perfect match for my love of texture and big volume! Over the next three years, I traveled with yarn everywhere. I carried knitting in my purse, back pack, to the studio, coffee shop, around my apartment—you name it, I probably knitted there. I was knitting just to be knitting, to learn new stitch patterns and practice all sorts of new knitting techniques. One of the main things I love about knitting as a medium, is that you can work for a while and if you aren’t happy with the way the piece is coming out, you can pull out the yarn, wind it in a ball and try again. I loved the opportunity to reuse the material. As I did this, I began to notice a problem. The more times I reused certain yarns, the less beautiful they became! I realized through more textile education and knitting experience, that yarn material and construction had (pretty much) everything to do with the problem. Certain yarns simply could not be pulled apart over and over again. 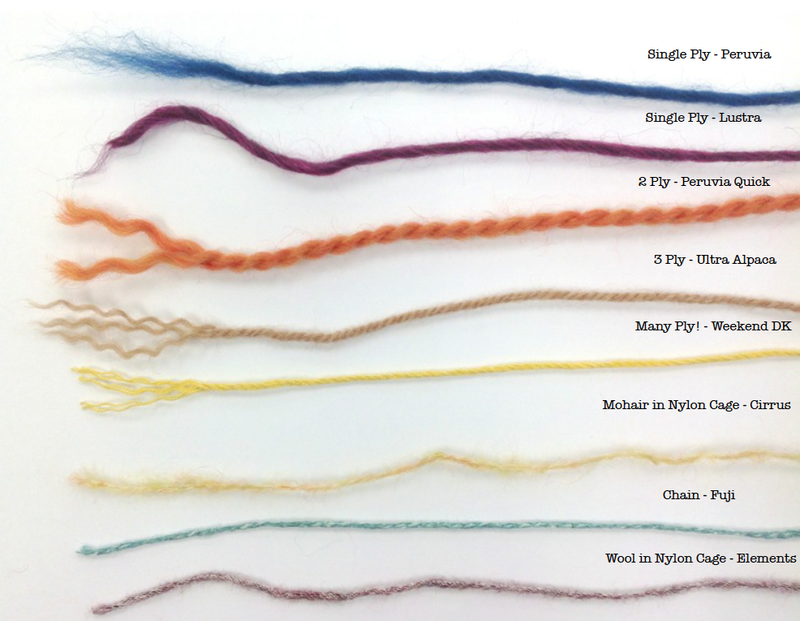 Below is a chart of yarns made of different fibers, plies, and constructions, that will help illustrate why this is so. Single ply yarn is similar to a roving. It’s a single strand that has been loosely spun. It gives a natural, super soft and cozy effect that is so wonderful to knit with! But it’s definitely more fragile. Your knitting with this yarn can be carefully unraveled from time to time, but I wouldn’t overdo it. If you’re really worried about a new pattern, practice with some scrap yarn to get the feel for the pattern first (Not rushing to knit with your new yarn is the ultimate test of self-control!). The examples shown above are Peruvia and Lustra. A yarn with two or three ply strands is usually a bit stronger and tends to hold up after knitting and unraveling time and again. This also depends on the fiber. Examples shown above are Pervuvia Quick which is a loose 2 ply wool, Ultra Alpaca which is a bit tighter 3 ply alpaca wool, and Weekend DK, a many-plied cotton blend. I also chose to highlight some yarn constructions that I consider more unique. Among the examples shown above is Cirrus, which is made of mohair and wool softly placed within a nylon cage. Mohair is one of my favorite fibers, but it’s usually very tricky to unravel when you’ve made a mistake! This long haired fiber commonly pills if it’s pulled and unraveled over and over again, so you may want to use another yarn to practice on beforehand. Fuji is a cotton silk blend chained yarn, which has a very light but sturdy construction. Elements as another example of unique yarn construction. It’s soft wool placed within a nylon cage. It knits very much like a single ply but shouldn’t have trouble pulling apart. The yarn feels super light and soft and has great stitch definition. It’s perfect for cables! There are so many yarns to work with and they all have their own unique qualities. I hope this chart provides you a bit of knitting help regarding fiber characteristics. With more practice, it all will begin to fall into place. Thanks for the great and useful information Emily! fabulous post! I have wondered this very question as I just had to rip out some beautiful alpaca and wondered if it would cost me the ball. question: do people rip out their swatches and reuse that yarn as well? I worry that if I don’t reuse my swatch yarn, I won’t have enough for the project (I make a lot of scarves so washing and blocking aren’t as important) Thanks. I’m glad this helped Jen! To answer your question I always save my swatch just in case I need a little extra yarn, but most patterns account for you gauge swatch in their yarn amounts. I like scarves super wide and long, I use every bit of yarn I have! As ever, Berroco has answered my many many questions. I have a better understanding of why a certain type of yarn can be re-used while others it is best not to. I will take note and keep this entry or future reference. Thanks! I’m so happy you can add this to your references! Yeah I used to think that way too, I thought taking out the stitches was no different than the delete button. Half of my projects would look great on the top but on the bottom it looked like a few of them had been through a rough wash in the washing machine! Wonderful chart, thanks so much! Some of my first projects look like that too! They’re some of my favorites though. It all comes with practice.